This was the quilt that I made for my friend, Catherine. 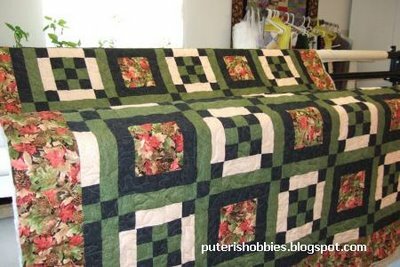 When she first visited me in 2004, she asked me to make her a quilt. She said that when she came again the following year, she would claim it. Heheh, I did not make her any quilt until she came to visit me this week. I finished the quilt except for the binding. After the binding is sewn on the quilt, it has to be finished off by hand .. like hemming a skirt. Catherine returned to her nephew's home in Milpitas today, but next weekend, I'll be seeing her again. I'll hand her quilt to her then and she doesn't have to stitch a thing! I had hoped to finish attaching the binding before she left for Milpitas, but she had to leave in a hurry because she was meeting another nephew and his family in Sacramento for lunch.